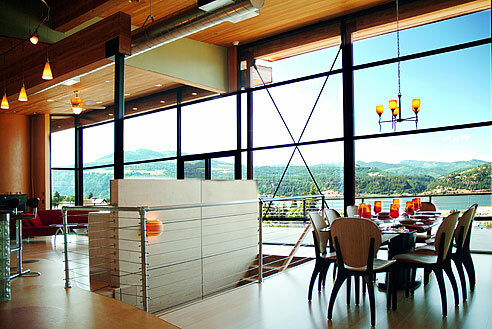 Modern architecture is a rare find in The Gorge. 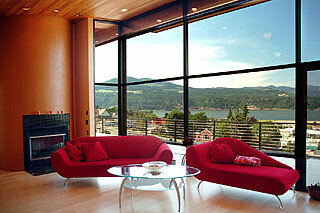 "The House of Views" designed by Brian Conaway, sits high on the bluff on Serpentine Drive, overlooking the resort town of Hood River, the Columbia River and the bluffs of Washington. Conaway, the owner/builder, enjoys designing and building homes with a unique flair - different than any others in the surrounding area. "The House of Views" features spectacular panoramic views, combined with exciting modern design. Every detail is consistent with modern architecture. The front of the house, facing the street, has a wide entry of stamped concrete flanked by double garages on both sides. The stylish aluminum garage doors have been designed with insets of poly carbonate that glow like rice paper when the lights are on inside. When asked how the grand open-air entry was designed, Conaway replied, " The design is a unique blend of materials and geometry with three curved glue lams, all lading at the same width, but each one having a different radius, and making a direct attachment to the shed style roof. 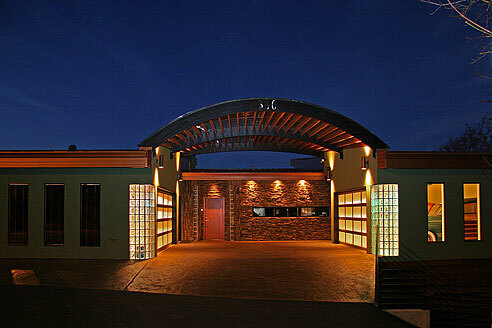 Natural light enters the breezeway due to twin wall bronze poly carbonate covers over the arch." 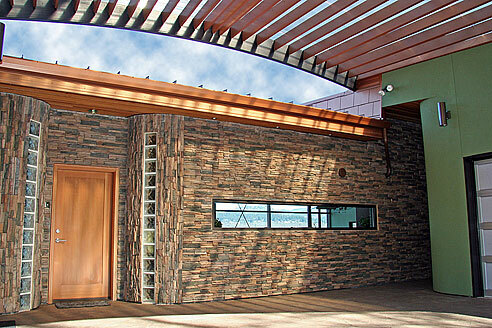 Rounded glass block corners have a green glow, enhancing the green stucco. Walking to the front door opening set in a rock wall alerts the senses to contemporary surprises awaiting inside and the long rectangular window reveals the breathtaking kitchen at counter level. Once the front door opens, "WOW!" is the only way to describe the full glass windows extending from the floor to ceiling - the entire 64 feet in length of the main floor at the top of three levels. Wide decks with overhangs angling to the sky and cable railings extend one's sense of space. 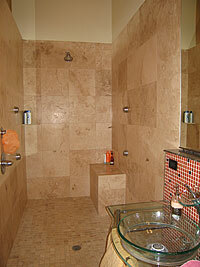 Soft north light pours into the space, highlighting rich, bold colors perfectly matched with custom lighting. 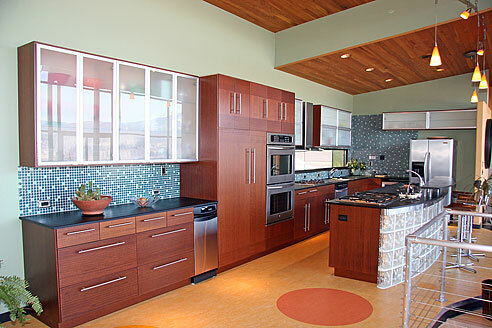 The kitchen is a wall of toast brown eucalyptus cabinets with frosted glass and aluminum trim below black paper stone counters, highlighted with the south wall covered in 1 inch shiny glass tiles in shades of teal and turquoise. Stainless steel appliances are placed for two cooks with two stovetops, two dishwashers, and two sinks. The island with bar counter on one side is supported with lighted glass blocks for an astonishing night glow. 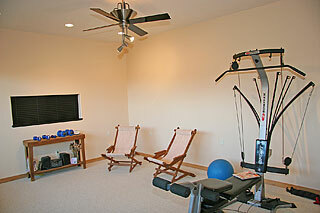 Downstairs one eye endeavors to take in the elegant curved 8-foot wide hallway spanning 54 feet in length. High ceilings and natural woven grass wall covering with art glass scones make this space a perfect gallary for your prized framed works of art. Three bedrooms with private baths open along the curved hall. 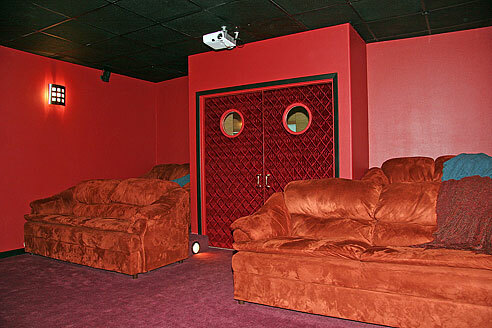 The theater with red suede sofas and a velvet-tuffed door is a fun surprise. The library is flooded with north and west light with birch bookshelves, bamboo floor, a fireplace and large sliding doors that open to the deck bringing in Gorge breezes. 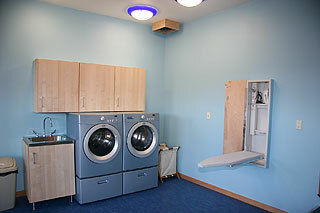 The gym, laundry room, mechanical rooms and huge storage spaces are on the lower floor. The last of three levels of wide decks with cable railings opens to each of the rooms. Unusual, fun, elegant are just a few of the ways to describe this house that will make a statement in Hood River for decades to come.